Houseplants bring the beauty of the outdoors inside while providing benefits of increased oxygen, humidity and air purification. 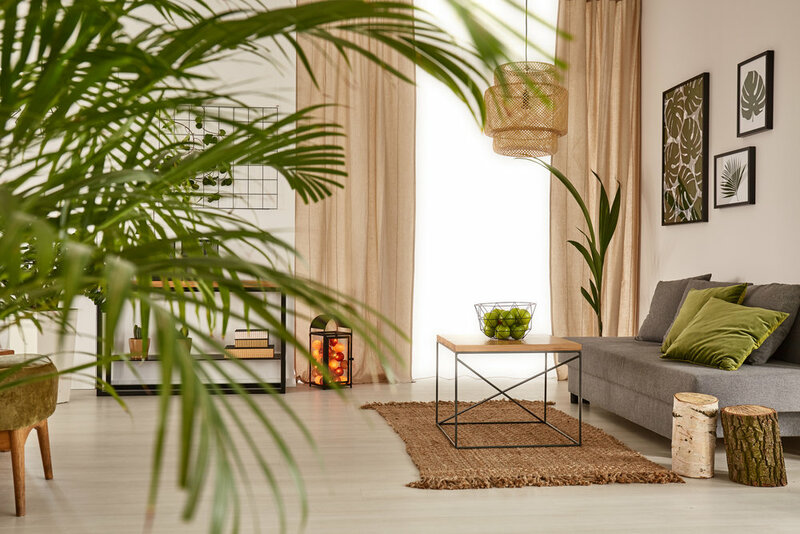 Bring your own indoor oasis to life by incorporating houseplants throughout every room of your home! Accessorize your living room with unique houseplants that add color and texture. 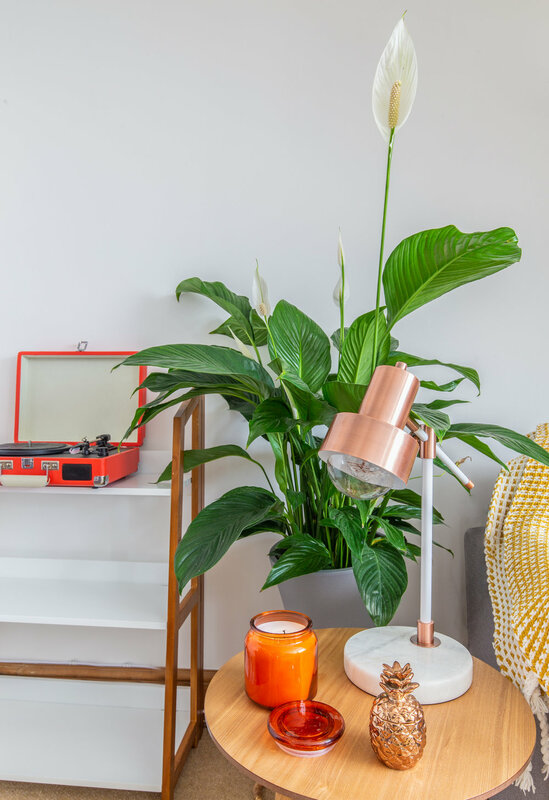 Monstera is a show stopping plant, sure to be a talking point from all your houseguests. It’s large green leaves with deep slits are recognizable from interior design and artwork around the world. Place your Monstera in a location with plenty of indirect sunlight and consistently warm temperatures. Plant in well-draining soil and provide a trellis or pole, as Monstera’s have aerial roots that love to climb. 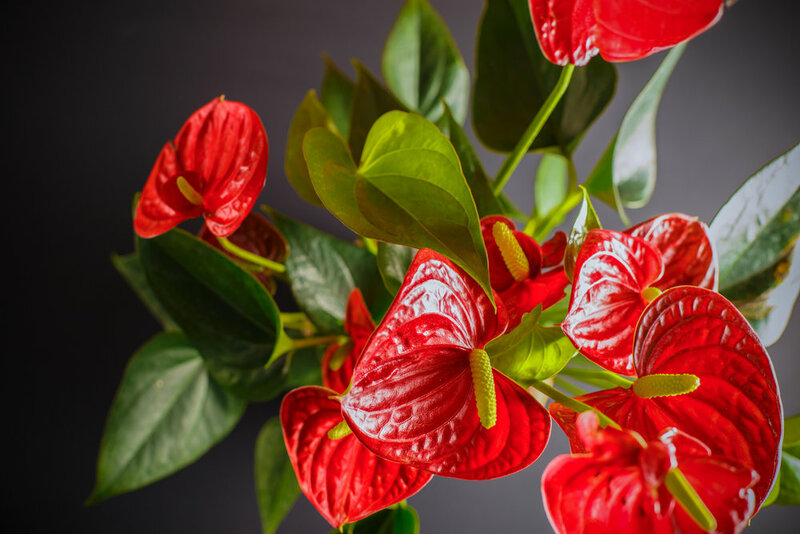 Add a punch of color to your living room with a gorgeous Anthurium plant. It’s delicate stems rise above lush green leaves with a showy flower atop. The flowers feature a waxy texture and come in white, pink and most commonly red. Place in an area with indirect light and water when the soil becomes dry to the touch. The Inch Plant makes a great addition to any living room and requires little maintenance. Place on a shelf or mantle with moderate light and allow this fast growing houseplant to trail down, displaying it’s purple and green leaves with zebra-like stripes. The Chinese Money plant, also known as the Pilea Plant, is a relatively new houseplant to the United States that is quickly growing in popularity. 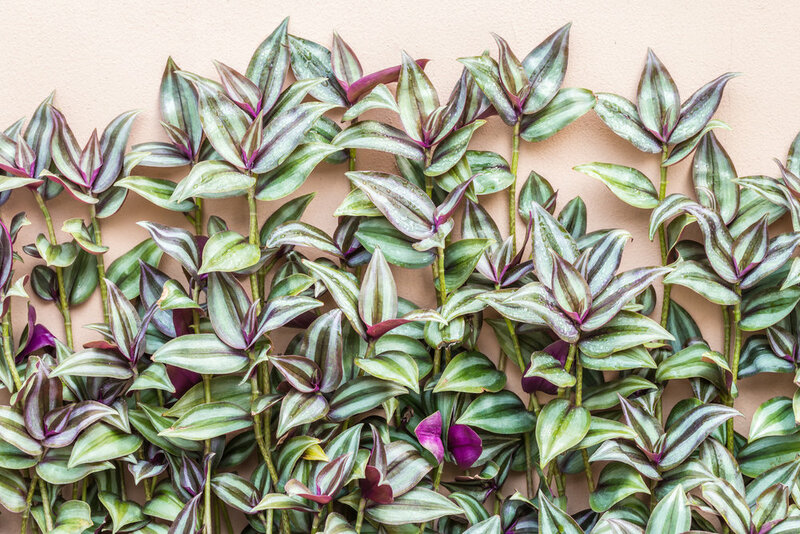 Sure to be a conversation starter, the Chinese Money Plant features thin stems growing straight upward, with round green leaves atop. Care is minimal; place your plant in an area that receives plenty of indirect light and provide well-draining soil, allowing soil to dry out between watering. Spice up your kitchen with edible herbs, sun-loving succulents and plants that accent your kitchen accessories. Grow herbs in a sunny kitchen windowsill to spice up your cooking! Herbs such as Basil, Parsley, Cilantro, Thyme and Rosemary make wonderful houseplants. The key to healthy indoor herbs is sunlight; place them in a location that will receive a minimum of six hours of direct sunlight. A south-facing window is best, but east or west facing will do. 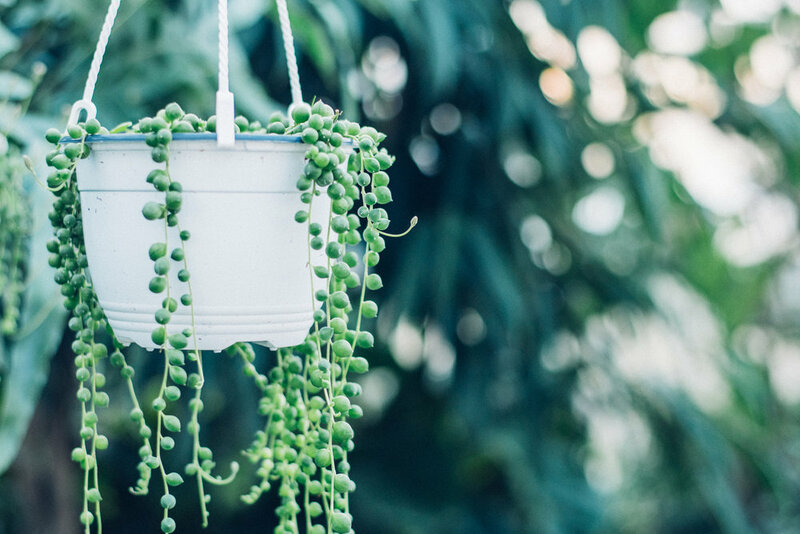 The String of Pearls is a quirky houseplant in the succulent family. It’s round leaves connected by thin, string-like stems look beautiful cascading over the edges of a hanging pot. This sun-loving succulent needs plenty of light; try hanging it above your sink or other sunny kitchen window. 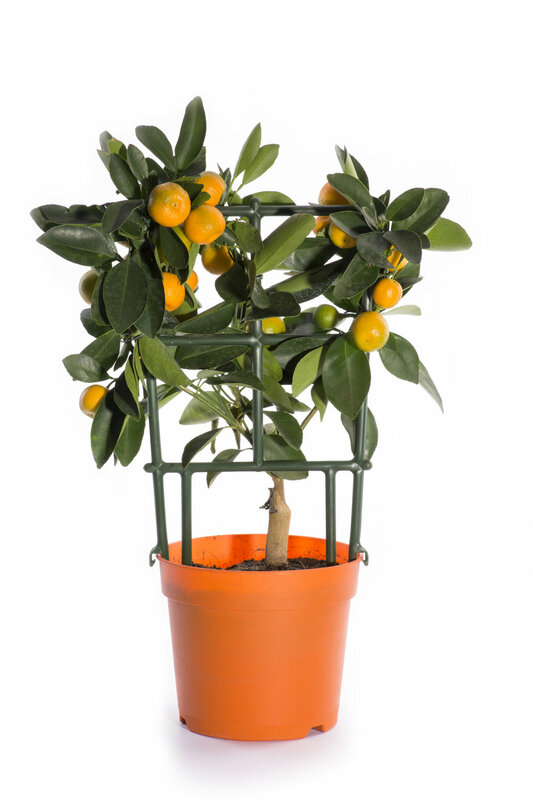 A cross between a kumquat and tangerine, the Calamondin is a dwarf orange tree perfect for indoors. It’s bright orange fruit pop against dark green leaves, adding texture and color to your kitchen. The beautiful fruits provide more than just looks; harvest after ripening and make delicious marmalade! Place your Calamondin tree in a location that will receive a minimum of four hours of direct sunlight. Do you have stainless steel appliances in your kitchen? Accent them with the Aluminum Plant! The Aluminum Plant features dark glossy green leaves with intricate silver-metallic accents. Most commonly found in hanging baskets, these houseplants also look beautiful trailing over pots. Place in an area that receives at least four hours of indirect sunlight. Avoid large amounts of direct sunlight, as it can burn the leaves. Support sleep quality and relaxation with houseplants that provide natural aromatherapy and air purification. 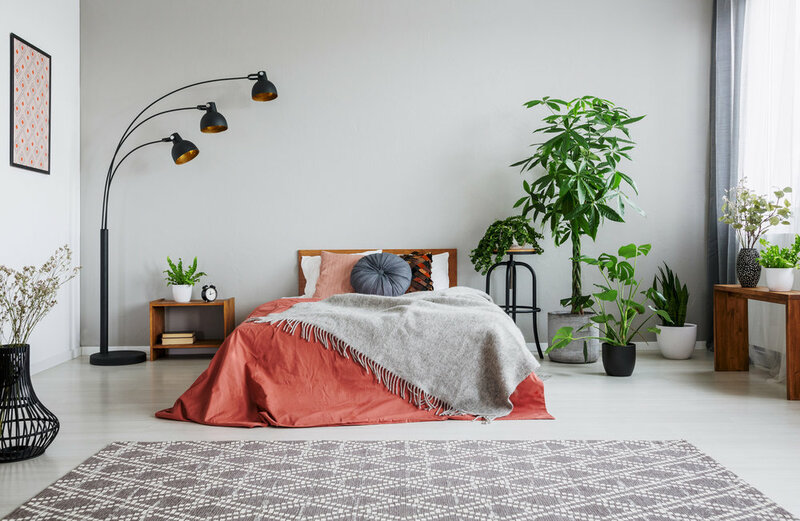 A low fuss plant that thrives in cramped spaces and low light- the Parlor Plant makes a great addition to your bedroom! Parlor Plants are slow-growers, but eventually reach heights up to four feet if left un-trimmed. Place your Parlor Plant in a corner that catches just a bit of indirect sunlight and do not over water. An added bonus- sleep better knowing the Parlor Plant is a natural air purifier! For natural aromatherapy, try scented geraniums. Pelargonium geraniums are bred for scented leaves and feature small, or no flowers at all. Their aromas come in a wide variety of traditional and uncommon scents like rose, apple, lemon, ginger, pineapple and even chocolate mint! Place your scented Geranium on a windowsill or atop a nightstand where it receives plenty of light and its fragrance can be appreciated. Peace Lilies are attractive plants that require little maintenance. Choose a spot in your room that receives low light and water it weekly. If you notice your Peace Lily is not flowering, try moving it to a new spot that receives a bit more light. Besides good looks, the Peace Lily has the ability to filter out harmful air toxins. You probably recognize the Fiddle Leaf Fig from home décor magazines and blogs everywhere. With large glossy leaves elegantly shaped like violins, it’s no wonder this is one of the trendiest house plants! The Fiddle Leaf Fig fits perfectly in a tight corner with tall ceilings, as it tends to grow up and not outwards. Place in an area of your room with lots of indirect light and no drafts. Don’t have space in your bedroom for a Fiddle Leaf Fig tree? Smaller options are available and look great on a nightstand or dresser. Freshen up your bathroom by adding pops of green. Lucky Bamboo is one of the easiest growing houseplants, making it a perfect option for the smallest and darkest of bathrooms. Lucky Bamboo enjoys indirect light, but can survive with very low light. Place in a vase or dish with some pebbles, adding just enough water to cover the roots. Warm and humid bathroom conditions are the perfect environment for orchids. They tend to be finicky, but your hard work will pay off with gorgeous, long-lasting tropical flowers. Plant your orchids in a fast-draining medium, such as fir bark or peat moss and water weekly. Place in an area that receives plenty of indirect sunlight. Ivy is an easy growing plant able to thrive with low light, inconsistent watering, and varying temperatures. Because Ivy tolerates many environments and grows rapidly, it’s harmful when brought outdoors. However, you can enjoy Ivy indoors as a fast growing houseplant that quickly creates a lush trailing canopy. Try placing Ivy on a shelf near your shower and as it continues to grow, begin wrapping it around your shower rod. Boston Ferns love humidity, making them ideal for bathrooms. Choose a location with plenty of indirect sunlight; a counter top, shelf or on the edge of a tub works great. Boston Fern’s love moisture, so make sure it’s soil never completely dries. Low-maintenance houseplants give an inviting element in your office to boost productivity. No home is complete without some quirky succulents and cacti! 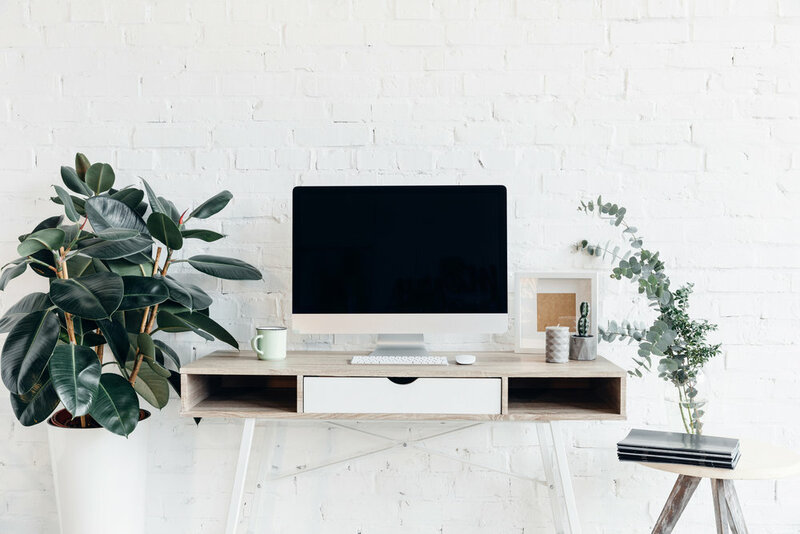 Perfect for the office due to their lack of maintenance; simply plant in well-draining soil, water once a week and place on a desk or windowsill where they’ll receive plenty of light. Want more tips on succulent and cacti care? Check out DIY Indoor Potted Succulent Garden. ZZ Plants are often mistaken as fake plants, due to their ability to thrive with little care. In fact, the best way to care for a ZZ Plant is to almost forget they’re even there! They do best when given moderate light, but live just fine with low levels of lights, including strictly fluorescent lighting. Water your plant when the soil has dried out; over-watering is the most common way to kill a ZZ Plant. 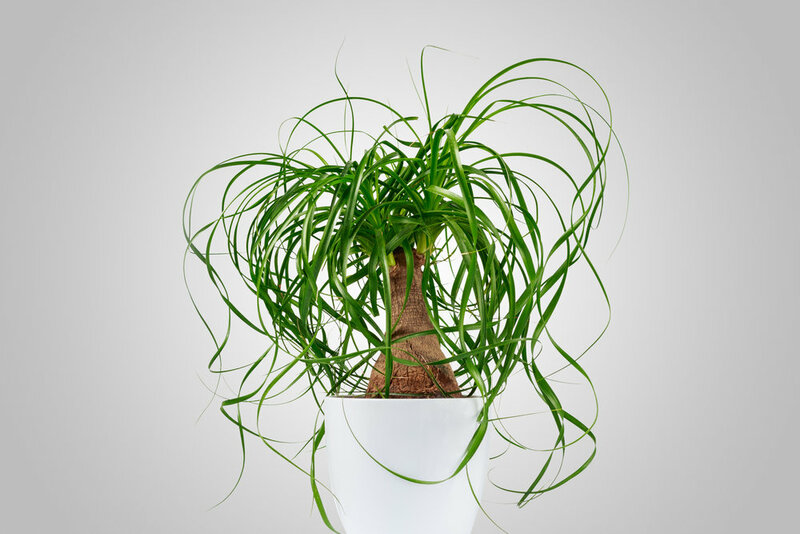 The Ponytail Palm is a funky plant that’ll bring a smile to your face. Place in a sunny corner of your office where it’ll receive six to eight hours of light per day. Plant in well-draining soil and water sparingly, allowing the soil to fully dry between each watering. One of the most common and non-fussy houseplants out there, the Snake Plant is perfect for the office. It’s straight-growing leaves feature a variance of glossy greens and yellows. Besides providing a pleasant appearance, the Snake Plant is an air-purifier, mentioned in NASA’s Interior Landscape Plants for Indoor Air Pollution Abatement as removing up to 107 know air pollutants! The Snake Plant isn’t picky when it comes to light; it does best in bright light but can thrive in shady corners. Plant in well-draining soil and water sparingly. Set your houseplants up for success by feeding them some plant food. Clean Water Grow Plant Food is a great fertilizer for houseplants because it provides balanced nutrition. GROW is also slow release, apply once a year in the spring and GROW will continue to feed your houseplants all year. Is your houseplant changing color or texture, losing leaves or not blooming? The Plant Doctor: How to Save a Dying Houseplant provides great information and solutions on common houseplant issues.